Cool off with a dip in the pool wearing the Versus Versace Triangolo Mare Donna Jersey. Classic triangle bikini top. Plunge neckline. Adjustable shoulder straps. Back interlocking clasp closure. 80 percent nylon, 20 percent elastane. Lining: 73 percent nylon, 27 percent elastane. Hand wash cold, dry flat. Made in Italy. This item may ship with an attached security tag. Merchandise returned without the original security tag attached or a damaged tag may not qualify for a refund. If you~re not fully satisfied with your purchase, you are welcome to return any unworn and unwashed items with tags intact and original packaging included. 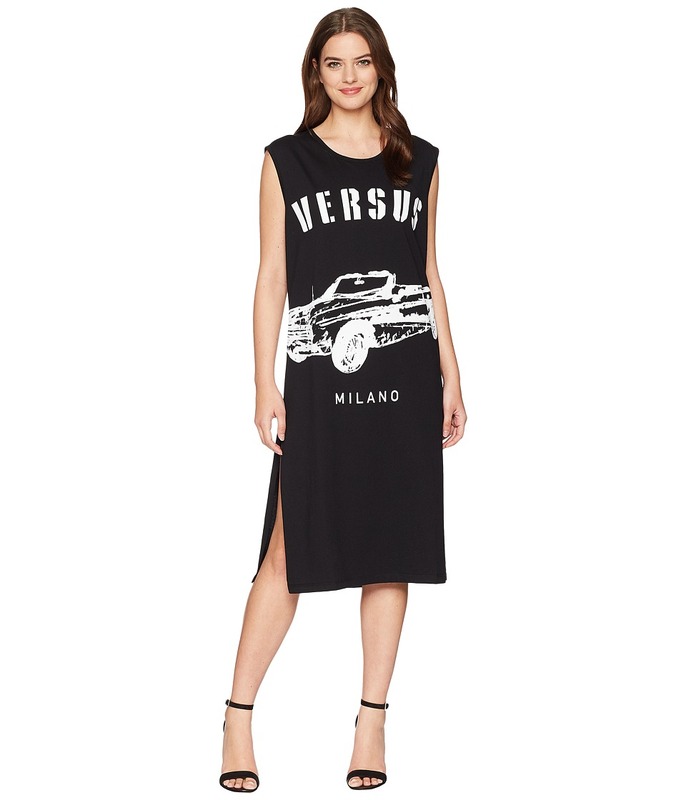 Ease into your day wearing the Versus Versace Abito Donna Jersey. Sheath silhouette. Scoop neckline. Sleeveless. Mesh overlay. Side vents. Pull-on construction. Straight hemline. 95 percent polyester, 5 percent elastane. Lining: 100 percent cotton. Machine wash cold, flat dry. Imported. This item may ship with an attached security tag. Merchandise returned without the original security tag attached or a damaged tag may not qualify for a refund. Measurements: Length: 38 in Product measurements were taken using size SM. Please note that measurements may vary by size. 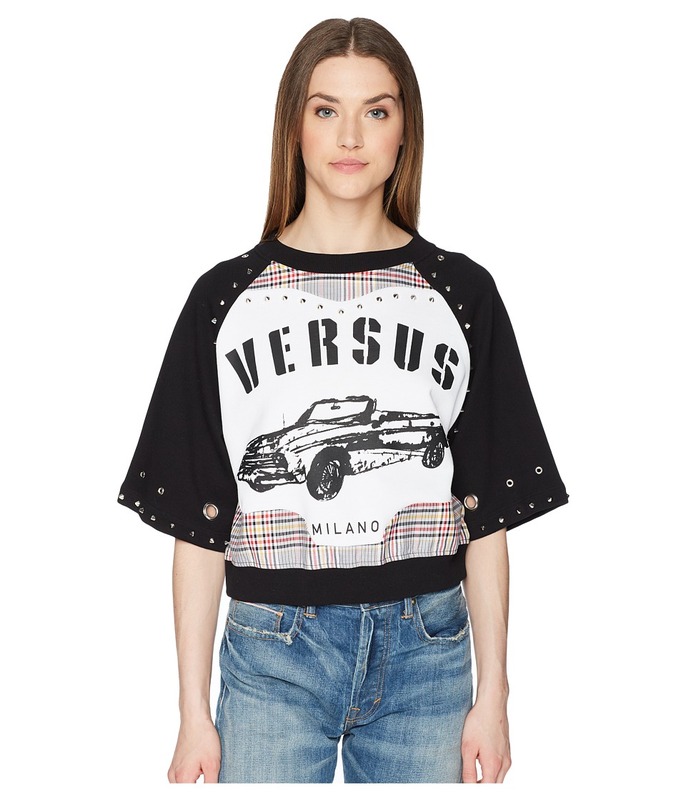 Tap into your fashion rebel wearing the Versus Versace Abito Donna Jersey. Scoop neckline. Sleeveless. Brand name and classic car graphic at front. Side vents. Pull-on construction. Straight hemline. 100 percent cotton. Machine wash cold, dry flat. Imported. This item may ship with an attached security tag. Merchandise returned without the original security tag attached or a damaged tag may not qualify for a refund. Measurements: Length: 44 in Product measurements were taken using size SM. Please note that measurements may vary by size. 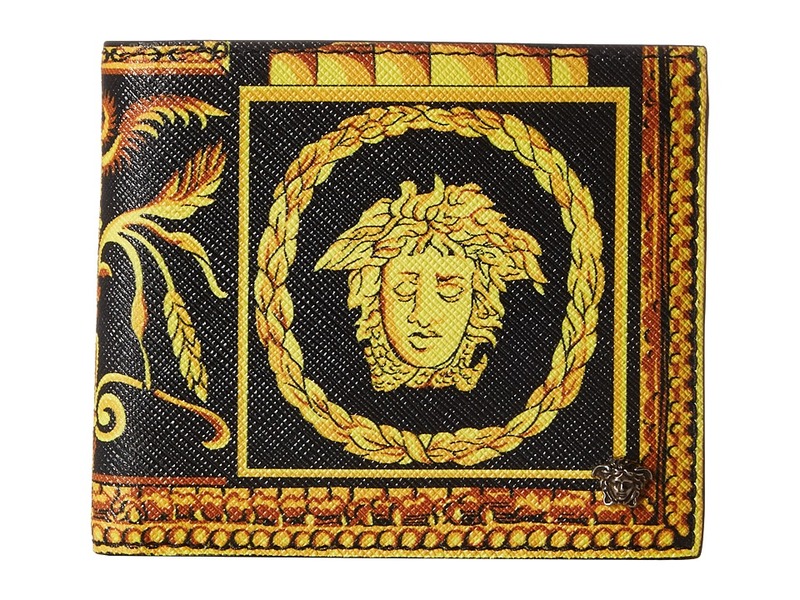 Tap into your fashion rebel wearing the Versus Versace Abb. Sportivo - Felpa Donna. Crew neckline. Crop style. Elbow sleeves with stud and grommet cuffs. Brand name and classic car graphic at front with plaid panels. 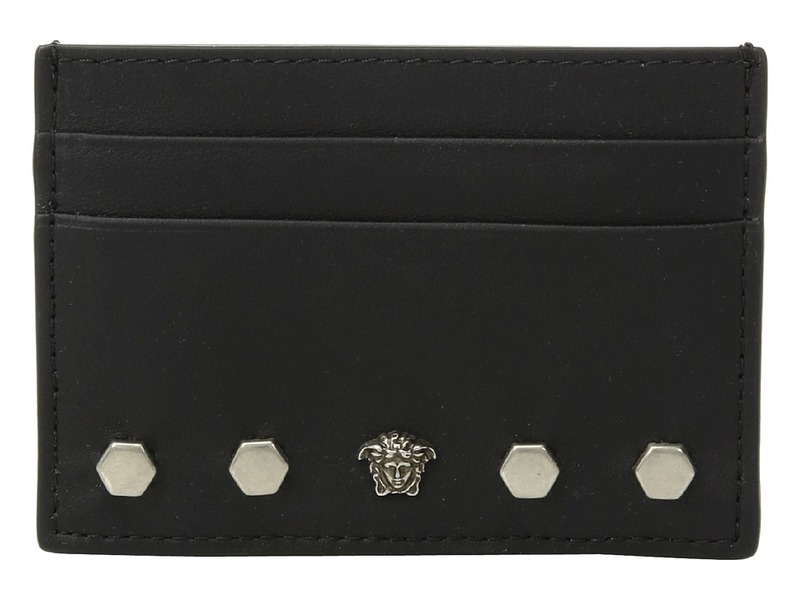 Stud and grommet details throughout. Pull-on construction. Straight hemline. 100 percent cotton. Machine wash cold, dry flat. Imported. This item may ship with an attached security tag. Merchandise returned without the original security tag attached or a damaged tag may not qualify for a refund. Measurements: Length: 19 in Product measurements were taken using size SM. Please note that measurements may vary by size. Slip on this sophisticated swimwear and show them who~s the boss in your Versus Versace Slip Mare Donna Jersey Bottoms. Classic color bikini bottom. Low-rise stretch waist hugs the body. Belt loops at the waist. Brand name logo embossed in shining contrast silver at back. Modest rear coverage. Materials: 80 percent polyamide, 20 percent elastane. Machine wash cold, line dry. Made in Italy. This item may ship with an attached security tag. Merchandise returned without the original security tag attached or a damaged tag may not qualify for a refund. Measurements: Length: 7 in Product measurements were taken using size SM. Please note that measurements may vary by size. If you~re not fully satisfied with your purchase, you are welcome to return any unworn and unwashed items with tags intact and original packaging included. Slip on this sophisticated swimwear and show them who~s the boss in your Versus Versace Slip Mare Donna Jersey Bottoms. Colorful bikini bottom. Low-rise stretch waist hugs the body. Belt loops at the waist. Chain-link and bag strap pattern featured throughout. Modest rear coverage. Materials: 80 percent polyamide, 20 percent elastane. Machine wash cold, line dry. Made in Italy. This item may ship with an attached security tag. Merchandise returned without the original security tag attached or a damaged tag may not qualify for a refund. Measurements: Length: 7 in Product measurements were taken using size SM. Please note that measurements may vary by size. If you~re not fully satisfied with your purchase, you are welcome to return any unworn and unwashed items with tags intact and original packaging included. 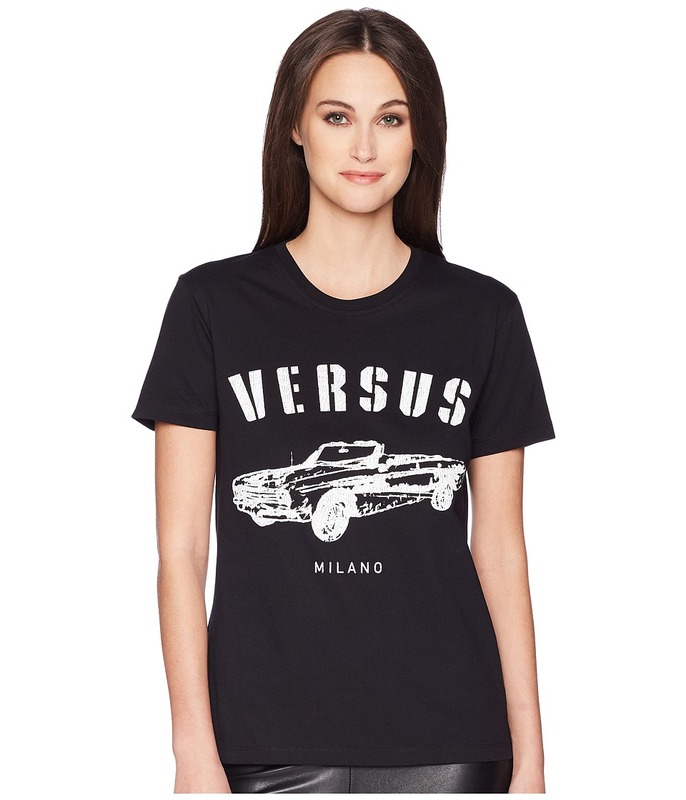 Tap into your fashion rebel wearing the Versus Versace T-Shirt Donna. Scoop neckline. Short sleeves. Brand name and classic car graphic at front. Pull-on construction. Straight hemline. 100 percent cotton. Embroidery: 100 percent polyester. Machine wash cold, dry flat. Imported. This item may ship with an attached security tag. Merchandise returned without the original security tag attached or a damaged tag may not qualify for a refund. Measurements: Length: 24 in Product measurements were taken using size SM. Please note that measurements may vary by size.